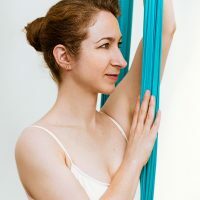 Unnata® Aerial Yoga teachers help you progress in your yoga practice by using the yoga hammock as the magic “key” to unlock places where you get stuck in your practice, or hold chronic tension in your body. This is how the process works: As you progress in your yoga practice, you’ll learn to breathe more deeply while sustaining an asana for longer. Yoga postures might look solid and statue-like, but they are actually an active series of micro-movements in the body, that require deep internal focus to sustain. As you breathe while holding a posture, you discover and then fine-tune the alignment of your limbs and joints. Healthy alignment means you can support a posture for longer periods of time; a longer hold in a posture encourages fuller, deeper breaths. 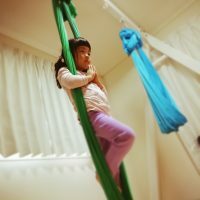 In Unnata® Aerial Yoga, you use the hammock as additional support to properly align the limbs, which allows you to sustain positions longer, which likewise leads to deeper, more easeful breaths. 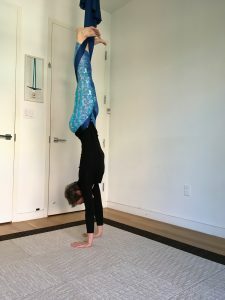 With the assistance of the hammock, you can explore a broader range of flexibility in standing poses while developing the strength to sustain the position for longer periods of time – even on the mat. Frequently on the mat, students hold back a little from exploring their full flexibility so that they can stay in the position longer. Or, students may go to their full flexibility, but then need to release from the position quickly. With the assistance of the hammock, you can hold a position longer, and develop the necessary strength, while also giving yourself the time to breathe deeply and fine-tune your alignment. 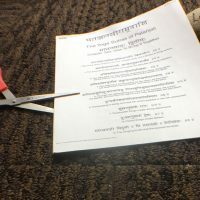 You can also use the hammock to learn the shape of challenging mat postures (for example, wheel pose, or the splits), and discover the energetic experience in your body, even before you have the full strength to support your own body weight in the asana. Over time, you’ll develop the capacity to hold it on your own. For some aerial yoga positions, the hammock will fully support your body in an inversion, as you dangle just an inch or so off the ground. In these positions, you discover what being upside-down feels like internally, while conquering any nervousness or fear! With practice, the fear dissolves, and the sensation of being inverted becomes more natural. Eventually, in future mat yoga classes, you will embrace the upside-down sensation without fear. Another advantage to Unnata® Aerial Yoga is that it’s okay to “fall off balance” because your hammock will catch you! 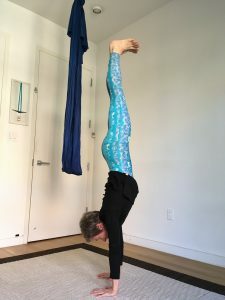 You won’t fall to the floor if you lose your balance – you’ll be gently held as you develop the core strength necessary to maintain a stable, centered and grounded position. This will improve your balance, even in traditional mat asanas. Hatha Yoga is about developing strong core stability and exploring flexibility while clearing any mental roadblocks that would limit your practice. Unnata® Aerial Yoga classes develop a brave heart and a strong core, which through persistent practice help you master any mat posture.